Do you know that Parental Burnout is at epidemic levels in the US and Canada? Recently, the Business Performance Innovation Network conducted a survey of parents in the US and Canada and the results are nothing less than shocking. Of the 2000 parents that responded to the survey, 60% have experienced parental burnout. What’s even more surprising and concerning is that 40% of parents believed they were significantly or profoundly affected. Think of it. 40% of parents are suffering with significant or profound parental burnout. What exactly is Parental Burnout and what can be done about it? 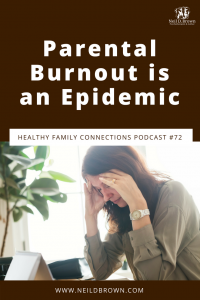 So briefly, Parental Burnout is a state of physical, mental and emotional exhaustion and, simply put, it occurs when there is more going out than there is coming in. Over time, even parents with the best intentions run down and parental burnout leaves them feeling chronically fatigued, often experiencing sleep and concentration problems. It can lead to depression, chronic anxiety, and illness. We know there are a lot of parents experiencing Parental Burnout. Maybe they all just need to parent better. Read a few more parenting books, get some therapy. I’m going to tell you, that’s not it! That’s not going to do it! We’ve been on that train and it isn’t going anyplace. We have a real social crisis here and we need to address it with a bigger sense of what’s wrong and better vision of where we need to go to fix it. Why? The family is the cornerstone of our society and if families aren’t strong, our children won’t grow up physically, emotionally or socially strong, and our society will be seriously weakened. So let’s take a hard look at what’s going on and what we need to do. All three of these lead to a lack of cohesion in the family. And what we need is cohesion in the family. A feeling in the family that we are all connected, interdependent, and that everyone in the family is important and needed. Right now I think we’re raising kids to be self-centered, just focused on their own activities, whether those activities are schoolwork, sports, music, social life, or anything else. Rhen it’s up to parents to continue to support and resource those activities and nothing is expected to come back to the family, “Just do a good job with your activities” and that’s enough. But we have parents that are stressed out managing their jobs, the home, their finances, and their kids’ needs and their kids’ behaviors. So what’s to be done? Here are some things I recommend to families coming to see me. First and foremost, Parents have to recognize that their needs matter, that they matter. They are not just servants to their roles of parent, employee and spouse. They are full human beings with their own needs for fulfillment and self-expression. And because of that, they can ask more of others. They can ask more of their employer, their spouse, their neighbors and friends, and maybe most importantly, they can ask more of their children and teens. And from this empowered personal position, things will go much better. From an early age, we need to teach kids to clean, to organize, to cook, and to look after and support, and engage with each other. Think about it, they will be making messes their whole lives, so they are way better off if they know how to clean up messes. They’ll be using and dirtying bathrooms their whole lives, best if they know how to clean a bathroom. They can vacuum, wash windows, how about cooking? They will eat their entire lives and right now we, at least in the US, are physically unhealthy. Why? Well maybe it’s because we’re eating takeout or eating out, or living on junk food, and unhealthy snacks. When kids are involved in making the food they eat, they are more likely to eat it, so less fussy eaters who want only nachos and not fish and bok choy, or broccoli. When we involve our kids in critical areas of running the house, and we make it routine, they make a real contribution. They feel part of the family, they feel good about themselves, they learn, and parents don’t feel like they’re constantly herding cats. Now if trying to get your kids to fulfill their chores or engage responsibilities is a struggle, well that’s a Control Battle and parents need to take a step back, see the Control Battle for what it is, and adopt a Control Battle ending strategy. That constant struggle to get kids to fulfill responsibilities where kids are constantly avoiding or resisting will sap a parent’s emotional resources and leave them burned out with no progress to feel good about, and that’s a formula for parental burnout. Be clear, first with yourself and then with your teenager, exactly what you want them to do differently. Stay completely positive in your tone, and let the job of changing their behavior belong to your teen, not you. Be patient. Remember all of their good qualities and what you love about them, and be sure to communicate that. Let the magic of Earned Privileges do its job. Stop giving consequences for things done wrong, and give privileges when your teenager is managing their responsibilities and being respectful. Teens earn privileges by managing their responsibilities with their best effort, and by being respectful and cooperative with their parents. Within reason of course, but disrespectful tantrums, door slamming, and arguing do not earn privileges. Now you’re parenting outside the Control Battle. You’re being positive, you’re letting your teen know you think of them in admiring and positive ways, and will give privileges, as soon as they are earned. You’re on their side - the ball’s in their court. They have the power to move forward. If we’re patient, that’s exactly what they’ll do. What Else Can Parents Do To End Parental Burnout? Remember parents, when you operate from an empowered place, your leadership will be respected and you’ll get the support you need and deserve. Make sure you have a regularly enforced Internet and device policy in your home. Include a place that all handheld devices go when they are off limits. At the very least, devices should be off limits for kids, teens and parents during meals and an hour before bedtime. Get parenting support. We all need support and if we don’t get it, we lose perspective and burn out. Spend time with people who know and appreciate you. Stay away from or set limits with anyone whose tendency is to be critical. If you and your partner are at odds over parenting, don’t focus on the problems or solutions first. Start by listening emphatically to each other. You’ll create a safe, emotionally supportive environment that will stave off parental burnout. Get some of that all-important Me Time. Remember, you are more than a parent, a spouse, or employee. You’re a whole individual with your own interests, needs and forms of expression. Sometimes we need to be out with friends, riding our bikes, painting a landscape, or reading a book. Me Time is something we need to feel whole. Without it, we burn out. Finally, make sure your work environment is flexible to your parenting needs. These days, parts of many jobs can be done from home. Negotiate that with your supervisor. Employees that are supported by their supervisors remain loyal and get the job done. If your job must be done on site as many do, make sure your employer is flexible to adjust your schedule to accommodate your parenting needs. Remember, you matter! Without you at your best, you and everyone around you are missing out. Don’t be afraid to ask for help. Say what you need from others. Take time for yourself. If you're ready to take that first step towards overcoming parental burnout. Download my free parental burnout guide today to get started on the road to recovery. And please remember, take care of yourselves; you need it, you deserve it, you’re worth it. Bye for now. Be sure to subscribe to The Healthy Family Connections Podcast on iTunes for up to date information and advice from Neil D Brown -- all for free!